Thanks to changes included in the Tax Cuts and Jobs Act (TCJA), many more businesses can now use the simpler and more-flexible cash method of accounting for federal income tax purposes. The new law also includes some other tax accounting changes that are good news for small businesses. Like many TCJA changes that apply to businesses, these provisions are permanent. Here's what you need to know. 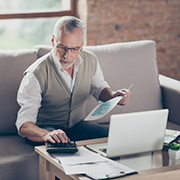 Under the TCJA, for tax years beginning after 2017, cash method accounting is allowed for these taxpayers if their average annual gross receipts for the three previous tax years didn't exceed $25 million. The cash method is allowed even if the purchase, production or sale of merchandise is an income-producing factor for these taxpayers. Under the TCJA, for tax years beginning in 2017 and beyond, businesses with average annual gross receipts of $25 million or less won't be required to use the PCM for contracts expected to be completed within two years. Accounting for taxes can be complicated. Fortunately, tax reform legislation has expanded the eligibility requirements for some simplified tax accounting methods for small businesses. Contact your PDR tax advisor to determine whether these alternatives could work for your business in 2018, as well as for additional tax planning opportunities under the TCJA.